Tomorrow's Lawyers predicts that we are at the beginning of a period of fundamental transformation in law: a time in which we will see greater change than we have seen in the past two centuries. Where the future of the legal service will be a world of internet-based global businesses, online document production, commoditized service, legal process outsourcing, and web based simulation practice. Legal markets will be liberalized, with new jobs for lawyers and new employers too. This book is a definitive guide to this future - for young and aspiring lawyers, and for all who want to modernize our legal and justice systems. It introduces the new legal landscape and offers practical guidance for those who intend to build careers and businesses in law. Tomorrow's Lawyers is divided into three parts. 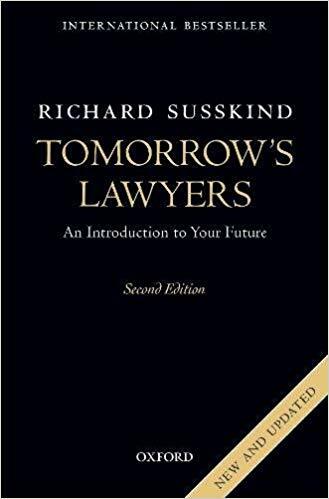 The first is an updated restatement of Richard Susskind's views on the future of legal services, as laid out in his previous bestselling works, The Future of Law , Transforming the Law, and The End of Lawyers? . He identifies key drivers of change, such as the economic downturn, and considers how these will impact on the legal marketplace. In the second part, Susskind sketches out the new legal landscape as he predicts it, including the changing role of law firms, and in-house lawyers, with virtual hearings and online dispute resolution. The third part focuses on the prospects for aspiring lawyers, predicting what new jobs and new employers there will be, and equipping prospective lawyers with penetrating questions to put to their current and future employers. This new edition has been fully updated to include an introduction to online dispute resolution, Susskind's views on the debates surrounding artificial intelligence and its role in the legal world, a new analysis of new jobs available for lawyers, and a retrospective evaluation of The Future of Law , Susskind's prediction published in 1996 about the future of legal services.